Canada boasts several centers of excellence with a group of internationally renowned investigators that are at the forefront of oncology clinical research. Many of these centers are highly skilled in early phase work and are highly motivated to help fix a system that is in dire need of repair. Read the transcript below or listen to this 14 min podcast interview with Karen Arts, Director of Business Development at the OICR and chair of the board of directors for the Network of Networks (N2), as she talks about the steps Canadian organizations have taken to foster collaboration among stakeholder groups, while improving infrastructure and processes to enhance Canada’s clinical research capability and capacity. Can you tell us about your role at the Ontario Institute for Cancer Research? Karen Arts: In order to know what my role is, you need to know what the mission and vision of the OICR is. We are a translational cancer research institute that conducts research in small molecules and biologics, stem cells, imaging, genomics, informatics, pathology and we also do high impact clinical trials. We are funded through the Ministry of Economic Development and Innovation. My role here, as Director of Business Development within the High Impact Clinical Trials, is to try and facilitate connections between researchers, research centres, pharma companies, and the relevant stakeholders in clinical trials. We try and find ways to collaborate, to help improve the quality and speed with which we conduct clinical trials. And of course, because we’re a cancer research institute, it’s focused on cancer and on what we call high impact clinical trials, which is trying to link many different aspects of research together. Rather than just testing drug A and indication B, we’re looking at combining genetics, biomarkers, imaging, and different analyses into one protocol. My role in that is to help facilitate those connections and provide ideas and suggestions where I can. 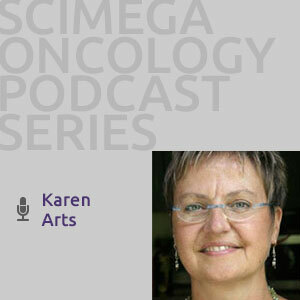 What are the biggest challenges for Canadian oncology research centres? Karen Arts: I would say the biggest challenge for research centres, from a clinical perspective, is resources. There’s not enough support from the government, from administration in institutions and from organizations, to really ensure that the right infrastructure and the right number of people and support tools are available to make it work well. I believe that science and operations go hand in hand. They should be considered equally important, but obviously in a different sphere. But I think right now it doesn’t matter how beautiful the science is because if the machine is broken, then you won’t be able to complete your study. I think research centres are facing very complex trials and the complexity of those trials, along with the complexity of the regulations and not having adequate resources to complete them, makes it very difficult for research centres to be sustainable and to be effective in conducting trials. How are these challenges affecting Ontario and Canada’s ability to compete on the global stage? Karen Arts: I don’t think it’s unique to Ontario and Canada. I think all western countries are facing stiff competition from other regions, such as Eastern Europe, Asia, and even Africa. And part of that I think is that the cost is significantly different there. Due to the different healthcare systems, patients have limited access to care in some places. As a result, many companies will go to those countries where they can recruit faster at a lower cost. And I think that affects us in that many trials are disappearing off the Canadian scene. We really need to do a good job in working together to keep research coming to Canada in the areas where we can compete. I think we can do something about speed. I think we can do something about quality. I think by providing projects that are of high quality, that recruit what we say we will and that are completed on time, will enable us to remain competitive. How is the OICR addressing these challenges? Karen Arts: The OICR is working with cancer centres in Ontario to try and provide them with support. In our earlier phases, we did that by providing all clinical research centres in Ontario with money to hire additional staff. That’s now been refocused on what we call high impact centres, where we try to see where we can have the biggest impact. In addition to that, we provide opportunities. We built a network. We have a clinical trial registry. We provide support through education, through standard operating procedures, and things like that. You mentioned network. What exactly is N2? Karen Arts: N2 is a large, not for profit clinical trial group in Canada that aims to be recognized as Canada’s alliance for excellence in clinical research. Our mission is to enable and enhance clinical research capability and capacity in Canada. It is an initiative of what I call a “coalition of the willing,” where people can join as an organization to try and come together to achieve the vision and mission. The idea is to standardize and create ways to share tools, resources, best practices, and to find ways to be more efficient in what we’re doing. By reaching out to each other we create a stronger network across clinical trials. We started with eight organizations in 2007 and incorporated as a not for profit. We are now close to close to 60 organizations that each represent large groups. For example, OICR represents 27 cancer centres in Ontario so that 60 can be multiplied by a factor of X, to reach researchers right across Canada. It’s a very extensive network, that with very little funding, has reached a very large group of people, to try and group together and move Canada to a higher level of best practices. Can you tell us more about the clinical trials summit? Karen Arts: Many of us are concerned about the current state of clinical trials and research in Canada so groups came together, which included the Association of Canadian Academic Hospitals, called ACAHO, Rx&D, the representative body for pharmaceutical companies and CIHR, the Canadian Institutes for Health Research, to try and organize a large meeting of stakeholders to take some of the issues that we identified as a group, and see what kind of solutions we could come up with. The summit was aiming to be different from a conference in that it wanted to come up with a true deliverable at the end of the meeting, and we did that. The meeting was held in September 2011 and the idea was to come up with an action plan that would allow us to move forward. An action plan was released in early 2012 that included nine recommendations that, if implemented, would help fix some of the problems that we identified. There were about 150 stakeholders from different organizations that attended the summit, to come up with the suggestions for the action plan. We’re now in the third phase, in that there’s been a follow-up report to indicate how well we’ve been able to achieve the outcomes of the action plan. Hopefully in this coming year, there will be some more concrete deliverables around that. It focuses on all kinds of things, like metrics, feasibility, making Canada attractive, standardizing IRB approvals, consent forms, SOPs, education, and training. Once that action plan is fulfilled, hopefully there will be a new one in place and we can start to look at the next set of issues we can address. The goal is to make Canada attractive and to keep trials here and to ensure that new and innovative treatments are available to Canadians through clinical trials. How important are initiatives like the reverse feasibility approach, the clinical trials summit and N2 in helping to attract early phase trials to Canada? Karen Arts: I think these initiatives are very important, particularly if they involve different groups. I believe there’s so much duplication and redundancy, that it’s really important to try and streamline efforts and find ways to work together. Approaches like the Reverse Feasibility Program will help investigative sites to take inventory of their own capabilities, so that they can market themselves to sponsors, and that will help to place trials in Canada. The summit had an action group that is developing a large online feasibility database that will be available for a lot of different people. These things will allow us to know what goes on, to work together and to be a little bit more efficient in the way we attract trials. Why should oncology drug developers care about connecting oncology trials in Canada? Karen Arts: I think there are a number of reasons. First off, it’s important to conduct trials in the countries where you will market them, but in addition to that, it needs to be representative. The populations in which you test, need to be representative of the populations where you will be using the drug. Canada is a great place to do that, because we have a very diverse population. We have a good number of clinical trial groups, and we conduct quality trials. We are trying to fix the machinery behind it, so I think it’s very important that people keep coming back here to help us keep Canada on the map. When should they be thinking of including Canada in their clinical trial plans? Karen Arts: They should start thinking about it at the time that they are developing drugs. It’s important to pay attention to where you’re going to go with clinical trials—not at the time that you’re ready to start, but at the time that you are actually still in pre-clinical. That will help you get your filing right, so that when it’s time to go to the regulatory bodies to file a clinical trial application, you already have the right information in the file. Canada is extremely well suited for Phase I trials, but obviously we also have lots of capability for Phase II and III. And many companies are also engaging in Phase IV studies to access Canadian populations. The other thing I should mention for non-Canadians, is that Canada has a universal healthcare system, which means that many of the clinical trial infrastructure costs is partially covered under the access to universal healthcare. While budgets obviously need to cover clinical trial costs, our system allows sponsors to benefit from certain components that they would need to pay for in other countries. What final advice can you offer small and midsized oncology drug developers about Canada in their clinical trial plan? Karen Arts: I would say contact us because groups like Scimega, N2 and the OICR can help you find the right people and match you up with investigators and sites that can actually produce the numbers that you’re looking for. By collaborating we can all work together to make sure that the trials you are planning will be successful and will help Canada to gain access to new and innovative treatments.